Once You are Log in, You have done the Signup Deposit in main wallet, you are ready to play. First select from the index from Quick Links (see circle 1), you want to play ,Then scroll your play to Rise or Squad side(see circle 2,3) if you are playing on the RISE , BACK, See the below (see circle 4), that means you are playing index that will close above the company price and your bidding to rise back means you are playing that market will close above the company price. When you placing a bid, don't assume you are matched - always look at your bet slip to confirm it. It should be matched with another user with someone who has an opposite opinion. After Placing a bet offer, bets can be returned as unmatched, partially matched or matched in full. Your bet can be matched If you are taking the price shown on screen, you will be matched on the majority of occasions. Markets change continually though so once the bet matched, it cannot be changed or cancelled. 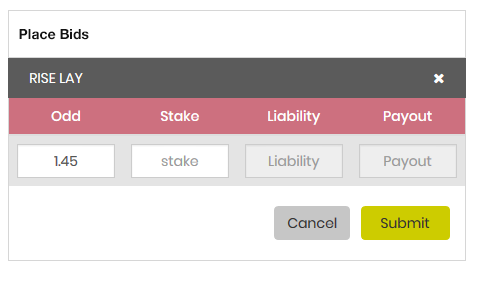 The status of your bets is displayed under the My Bet tab. In the following example the bet is unmatched. Be sure to click on Continue after your bet offer has been confirmed, otherwise your bet slip will not be updated. Important: Your bet could be matched a split-second after the unmatched bet slip has been shown as above. 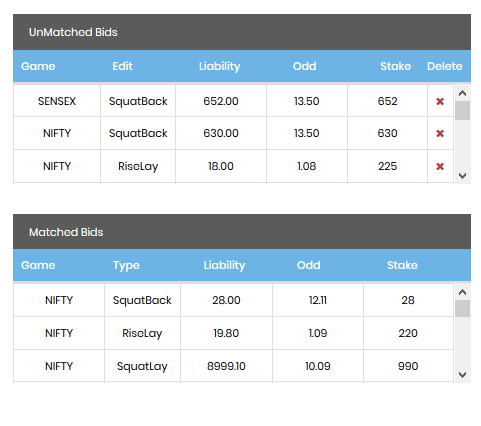 You can view the bet detail for matched / unmatched cancel or average ODD price in detail view of my bets. Just because it hasn't been matched instantly does not mean it can't still be matched. Unmatched bets stay in the market as offers until you decide to cancel them. It is much safer to change the odds of your unmatched bet than trying again and again to get matched. when you are placing a bet below the price shown on the screen, with below volume of value shown on the screen, then bet will be matched with highest bidding ODD, and when you are placing a bet below the price shown on the screen, with Higher volume of value shown on the first Column of screen, then bet will be matched with highest to Lower bidding ODD, after bet matched fully or partially, there will average ODD price that will reflect in your account statement. As prices and amount of money available constantly change on an exchange, particularly just before a market is in-play, you may have to adjust your odds or stake to get matched. 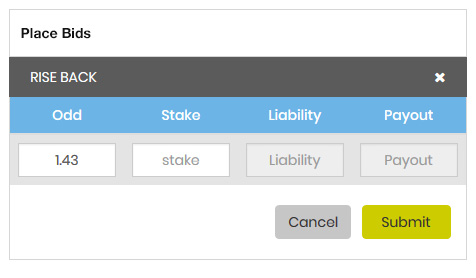 Note that the odds and stake value can still be changed in the image above. You are still able to change or cancel it at any time until the bet is matched. Customers always want the best price whether backing (as high as possible) or laying (as low as possible). Be aware that the StockMarketFair market screen will normally refresh every 30 seconds but the server can process hundreds of bets per second. In a busy market, prices and volumes will change constantly - don't assume that the prices only change when you see them on screen. Click on the refresh button just above the market to view the latest prices. If you are playing your bet to the back odd, Please put your stake value and see your liability payable , Before submitting you can view your profit and payout. Similarly, If you are playing your bet to the lay odd, Please put your stake value and see your liability payable , Before submitting you can view your profit and payout.